(Dec. 17, 2018) -- In an email sent today to UTSA faculty and staff, President Taylor Eighmy provided updates on the presidential, strategic and tactical initiatives underway to support the university’s strategic vision. Working with consultants from Page, the task force has determined preliminary planning principles and developed multiple overall framework options for both the Main Campus and Downtown Campus. Their work has included investigation of urban design strategies for key sub-areas at each campus: at the Main Campus, a new central open space, Innovation Park/Roadrunner Village, and UTSA Boulevard housing redevelopment; and the highway underpass and ramp, and eastern land blocks at the Downtown Campus. The team also continues to conduct site, data and stakeholder feedback analysis; UTSA students, faculty and staff are invited to share ideas with the task force by emailing masterplan@utsa.edu or texting 830-339-2252. The Classroom to Career Task Force received more than 100 responses to their recent survey, helping them to inventory existing experiential learning programs at UTSA. The task force held its final meeting on December 12 to compile data collected from campus, the community and peer institutions, and is now beginning the process of drafting a final report. Those who didn’t have a chance to complete the survey can still do so by contacting Assistant Vice Provost for Academic Initiatives Shannon Heuberger, who will connect respondents with a member of the task force. In an effort to further support faculty, postdoctoral scholars and graduate students in their research endeavors, UTSA has joined the National Center for Faculty Development and Diversity (NCFDD). Dr. Bernard Arulanandam, Professor of Biology and Interim Vice President for Research, Economic Development and Knowledge Enterprise has been named a Fellow of the National Academy of Inventors, advancing UTSA’s efforts to increase the number of faculty inducted into the national academies as a criteria for the National Research University Fund. This fall, the curriculum and campus experience sub-groups developed and administered a survey to the first-year students in the College of Public Policy and College of Architecture, Construction and Planning enrolled in a full-time schedule at the Downtown Campus. The survey collected student feedback on their overall experience at the campus with a focus on academic course offerings and transportation. Of the 150 students who received the survey, 117 participated. The task force is using the survey results to inform their work moving forward, including building the summer course schedule and negotiating more viable transportation options. Dougherty Insightings, a Dallas-based brand consulting firm, conducted interviews with university leadership in November to gather and interpret perceptions of the university brand. On December 3, the Senior Leadership Team participated in a brand workshop and brainstorming session to discuss UTSA’s brand components. The group completed a comprehensive review of the university’s personality, brand strengths, mission and values, and other key insights to best define how UTSA will be perceived. The Dougherty team will return in mid-January to present concepts for a brand platform and deliver a first round of brand positioning statements and potential taglines for upcoming university marketing campaigns. The Budget Model Task Force’s work to restate the FY 19 budget is nearing completion, and the final restatement will be available in January. The team finished its individual meetings with all the deans this month. Work has begun on the FY 20 budget under the new Incentivized Resource Management model, aligning the process closely with the university’s strategic plan. Eight Racing to Reaccreditation team members attended the SACSCOC Annual Meeting earlier this month. While there, they attended sessions that covered expectations for reporting out on the 2018 Principles of Accreditation, as well as sessions for managing off-campus sites, documenting faculty credentials and developing UTSA’s next Quality Enhancement Plan (QEP). They also met with SACSCOC Vice Presidents and learned important information concerning policy updates and changes on the horizon. UTSA celebrated the opening of the inaugural NSCC facility located in the North Paseo Building with a ribbon cutting on November 27. 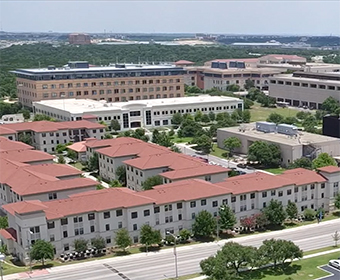 To date, UTSA is hosting five federal and four industry partners in the NSCC, including Sandia National Laboratories, 24th Air Force (AFCYBER), Air Force Cryptologic and Cyber Systems Division, Army Research Laboratory, National Security Agency, IPSecure, LGS Innovations, BuildSecFoundry and CNF Technologies. Meanwhile, work to determine facility programming needs for the new NSCC and SDS building downtown is nearing completion. Nine architectural firms submitted building design proposals, and the successful firm will be announced in the new year. The selection of a construction firm is also underway, with contractor interviews scheduled in mid-January 2019. The committee is close to finalizing its review of programming needs for the new Roadrunner Athletics Center of Excellence (RACE). Initial cost estimates are under review to ensure the programming is in alignment. One lead gift for RACE has been secured, and others are in the works. Work is underway on a schematic design for the new hall. The project is on schedule to begin construction in September 2019, and be open for residents by fall 2021. An informal bid process is underway to hire a company to perform a market study for the Cattleman’s Square Residential Tower. Once the market study is complete, a Request for Quotation (RFQ) will be issued in early in 2019 for design and construction. Similar to Cattleman’s Square, an informal bid process is underway to hire a company to perform a market study for Roadrunner Village. Once the market study is complete, a Request for Quotation (RFQ) will be issued in early in 2019 for design and construction. An effort is underway to secure approval from UT System to start the project. The selection process for a design firm will begin in January 2019. The first phase of this initiative will provide modular 25,000 gross square foot centralized Academic Advising Complex south of the North Paseo Building. The architectural firm Chesney Morales is under contract to do the work, and design is in progress. The complex is targeted to open in fall 2019. Learn more about the UTSA strategic vision.